If you want to make these vegetarian, just substitute the pork fat or bacon grease with your favorite oil. For an estimate on how much this makes, be sure to see recipe notes above. 4tbls Beef BouillonIf you estimate about 12 cups of water is being added to make the broth, 4 tablespoons of the gooey beef bouillon works great. You can always just use 12 cups of beef broth too. Rinse the dried pinto beans under running water, and remove any stones or bad beans you see. Put the beans in a pressure cooker. Sprinkle on the seasonings – chili powder, onion powder, cumin, garlic powder, salt, and pepper. Add in your beef bouillon too. Start filling the pressure cooker pot with water, while stirring to combine the seasonings and bouillon. Fill to the max capacity line. Put the lid on the pressure cooker and lock it down. Make sure the pressure valve is turned to sealed. Cook the beans in the pressure cooker for 85 minutes. I’ve seen recipes where there’s less cooking time, but the 85 minute mark seems to work best for this recipe. When done, relieve the pressure, and once it’s done spewing, open up the pressure cooker and drain the beans in a colander, reserving at least a cup of the bean juice. Now to make them refried. Place the pork lard or bacon grease into a large cast iron pan (any pan that is fine with a masher being brought to it is fine – so no teflon). Let it melt down, and then add the diced onions and garlic. At this point, it’s up to your taste as to how long to cook the onions down. I like a bit of a bite, so I really only cook them for a few minutes, but if you want them more incorporated into the beans, cook them down until translucent. If you have an immersion blender, skip to the next step. Turn the heat to medium-high and add the beans to the pan. At this point, you’re going to be cooking the beans, smashing them with a potato smasher, and adding the bean juice as necessary. As you smash the beans down, stir a bit as well, while also adding bean juice so that it’s not a thick mess, but you also aren’t worried about bean juice splashing everywhere. 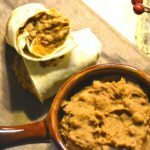 With all of this bean juice adding and bean smashing, you’re looking for a nice refried bean consistency. If you hand mashed in the previous step, skip this step. For those with immersion blenders, take that bad boy, throw in the bean juice, and start working your magic. The immersion blender should break up the beans and blend the bean juice for you… just like magic. Pat yourself on the back, because you just saved yourself a lot of bean pressing time. Now that your beans are nice and mashed, it’s time to start taste testing and adding more salt and pepper if needed. To make the burritos, heat the tortillas so they’re more manageable – you can heat 3 of them at a time in the microwave for about 10 seconds. Spread about a cup or 2 of beans on the tortilla, a handful of cheese, and wrap up. We like ours big and fat, so we usually go with closer to 2 cups of beans… like White Bread says, one burrito can fill you up! If you’re eating this for dinner and freezing some for later, serve what you’re eating now and wrap the rest individually in plastic wrap and place in a large Ziploc bag. When reheating, remove plastic wrap and microwave for 1-2 minutes to warm throughout. Serve with your favorite hot sauce – ours is Valentina.